Home » Action Alert! » Big Day for Bill 2491 is tomorrow! Big Day for Bill 2491 is tomorrow! Well tomorrow looks like a very big day for Bill 2491. Please read the attached flyer and come down to the county council building tomorrow, by 6pm, if you can. The chemical biotech companies are working as hard as they can to get the bill deferred, so that they can get to next year and craft a response in the state legislature where they will be able to dictate the terms. Our power resides on Kaua’i, we are organized on Kaua’i, and we will only get the information that we have a right to know from legislation on Kaua’i. Of course the state could step up and pass meaningful legislation next year, and I could purchase a multi million dollar lottery ticket, but I would not count on either happening. I certainly would not bank on it, and we cannot continue to risk the lives of Kaua’i residents while we wait for a magical solution from a place that has not been kind to this movement in the past. So PLEASE COME tomorrow night if you can, to the county building, by 6pm, or sooner. The time is now to vote! No more deferrals. 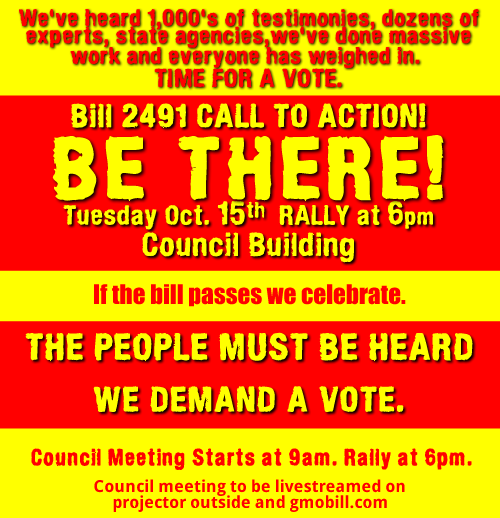 Your presence tomorrow night will send a strong message to the county council. If you wanted to pick one night where you could come to help the cause, tomorrow night would be THE NIGHT to choose. But please come if you can , lend your voice to a strong message for a united Kaua’i, for the health of the island and its people. Come after work, come when you can. The vote will probably not happen till late as there will likely be a chance for citizen testimony first. I close with a wonderful 8 minute video from Kaua’i residents asking for a voite on Bill 2491 now, very powerful. Again, please glance at the attached flyer, and HOPE TO SEE YOU MANY TOMORROW.